As announced in early 2018, ECA Group signed a cooperation agreement for subsea robotic services to Oil & Gas companies with a leasing offer on its latest generation A18D AUV creating a new dimension for its AUV services activity. Throughout 2018, ECA Group conducted several successful deep survey missions. The next generation AUV demonstrated its capabilities to perform multi-sensor surveys during deep sea operations (around 2,500m water depth) in the Mediterranean Sea. The A18D is the most compact multi-sensor AUV on the market for long-endurance deep water surveys (up to 3,000m). The AUV can capture up to 40km2 of high-resolution imagery per mission. Thanks to its complete solution package, the A18D underwater drone generated mosaics of high-resolution sonar imagery, bathymetry, sub-bottom profiling and video in record time using dedicated post-mission analysis software. Thanks to its unique 3D navigation accuracy, high-resolution data (MBES, SAS, SBP) was gathered in a single survey at a depth over 2,500m, with a perfect bottom altitude tracking at 25m. In the same survey, multi-sensors were used to obtain the best data possible. MBES (Multi-beam Echo Sounders) were used for the bathymetry and Synthetic Aperture Sonar (SAS) for the high-resolution imagery. With its highly accurate inertial navigation, the A18D provides centimetric XY resolutions of the bathymetry data. Unlike deep sea surveys with a boat, the measurement is much more accurate and less sensitive to the effects of sound velocity profiles (e.g. no effect of surface thermocline). Thanks to SAS, the resolution stays constant at 3cm*3cm – no decimetric object can be missed. The very high quality data, especially on shadows, allows objects to be quickly recognized. Environmental data, in particular sound velocity, was acquired throughout the mission (descent/survey/reassembly) in order to be taken into account during the post mission analysis with the best accuracy possible. Thanks to internal synchronization features, all the sensors work together to provide localized bathymetry and imagery data of the same objects. The recovery phase is critical because this is when human safety and material integrity can be exposed. Because of this, the ECA Group developed a dedicated LARS (Launch and Recovery System) for its AUV A18D. This simple and robust system enables the operator to control the AUV safely and easily, even in harsh conditions. Without moving parts or hydraulics, the LARS for the A18D is particularly reliable and easy to maintain or repair, and requires no complex preventive maintenance. The A18D can also be recovered very simply even when it is switched off thanks to an internal emergency rope, offering the operators a contingency plan – reducing risks. Global Digital Terrain Modelling of a 1Nm2 survey between 2,450m and 2,500m. Beyond the unmanned vehicle, ECA Group developed a complete operational system including the LARS and a comprehensive software suite for mission planning, real-time mission monitoring, data post-processing and report generation. To comply with standard requests, this map-oriented software suite can read or generate formats such as XYF, SEG, SEGY or TRA to maximize the data collected throughout the mission. To get the best from its unmanned vehicles, ECA Group developed various pieces of software managing all steps of the mission from the initial planning up to the final report generation. All the different software have now been merged into a comprehensive and homogeneous map-oriented software suite. Simple and safe LARS solution being used on the A18D. Compact, reliable and extremely stable, the A18D offers the best platform for deep water surveying enhancing the data quality while reducing integration and expenditure costs. Measuring 5m in length and weighing 500kg, the A18D can easily be operated from different kinds of vessels – from 18m multitask catamarans to 75m+ offshore supply ships. Reliable, endurant (more than 20 hours at depth) and stable (roll and pitch <0,15°/s), the A18D is the perfect platform to collect high-resolution data from very performant sensors such as Synthetic Aperture Sonars and Multi-beam Echo Sounders. Its unique design and advanced navigation features guarantee a high-level of stability and positioning to produce the best quality data possible. 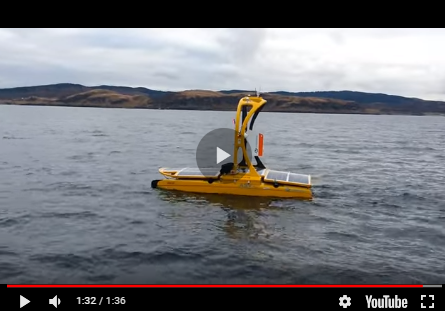 Along with its own central navigation system, the AUV is linked to a surface control station and through dedicated acoustic means, it can be regularly repositioned to achieve unsurpassed positioning accuracy. Its smart Altitude Following Mode (AFM) allows the vehicle to keep gathering high-quality data even on rough seabed bottoms. The A18D is fitted as standard with a Side Scan Sonar (SAS in option), Multi-beam Echo Sounder, Sub-bottom Profiler, and Physical and Acoustic sensors. ECA Group offers the A18D vehicle with a sensor suite based on the best products available on the market. This suite can be configured according to a customers’ specific requirements. The vehicle design provides the AUV with a high-level of reliability. Like a ROV, the A18D AUV has a modular design composed of several removable parts with quick access to electronic modules, which is a significant asset for day-to-day operations and maintenance as well as for repairs onboard a mothership during operations. In addition to the LARS, the A18D is equipped with a patented underwater catching system securing the AUV recovery in the harshest conditions. This unique solution enables the operator to recover the AUV in safer conditions before surfacing, reducing the safety risk to personnel and the asset.